There are 51 days until the San Francisco SGK 3 Day; that's a little over 7 weeks (I think...math is hard) which doesn't give me much time to get into hill-walking shape. So this morning we drove to Concord, hopped on the BART, and headed for San Francisco and the hills that still kick my asterisk. It wasn't any different today; my feet were fine, my back was fine, all was fine other than that I got awfully winded going up more than a block and my heart was pounding like crazy. If it's like last year, though, by the time the actual Walk rolls around I'll have done enough hills to be able to manage just fine. On tap for tomorrow, 5 miles or so followed by an hour in the pool. Oh, and I got something spiffy in the mail, for once something I bought. Granted, Char is the one who found them online when she was shopping for the bright pink spandex tights, but I kinda wanted a pair of the shorts. Now that I have the shorts...I kinda want a pair of the tights. If I'm gonna prance around in public in spandex, these just might be the ticket. I should have 'em next week. 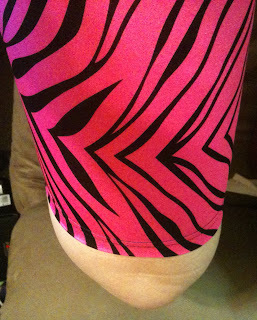 I'm liking the pink tiger stripes. I wish I could see them in person. I am hoping to be able to donate again this year - if not for this walk, then for the Atlanta one. Very pretty! Basic black for me, though! Don't have to draw too much attention to THIS body!